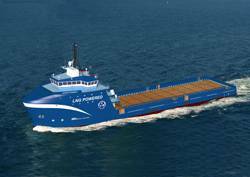 Harvey Gulf signs contracts to buld two additonal U.S. flag LNG-powerd vessels. Harvey Gulf International Marine ordered two additional 302’ X 64’, Dual Fuel Offshore Supply Vessels, bringing its total order to four. The contract signed today with Trinity Offshore is a follow on to the first two vessel order placed in October of 2011. Trinity will build all four vessels at their Gulfport, MS shipyard where the first Harvey Gulf LNG Powered Vessel hull fabrication was started last week. In addition to being powered by cleaner burning natural gas, the vessels will achieve “ENVIRO+, Green Passport” Certification by the American Bureau of Shipping. The requirements for this certification include, among others, that the vessels be continuously manned with a certified Environmental Officer, be completely constructed with certified environmentally friendly materials, and have advanced alarms for fuel tanks and containment systems. Along with Harvey Gulf’s other vessels under construction, these will be the first OSV’s to achieve this certification, making them the most environmental friendly OSV’s in Gulf of Mexico.